Toshiba has introduced the Qosmio F750, the world's first 3D laptop that doesn't require special glasses for watching movies or playing games in 3D. Like the Qosmio T851/D8CR model Toshiba announced in April, the Qosmio F750 can also do simultaneous 2D and glasses-free 3D on its 15.6-inch display. I haven't checked out the laptop myself, but early reviews indicate that Toshiba's glasses-free 3D actually works very well. The technology behind Toshiba's glasses-free 3D sends images of slightly differing perspectives individually to the left and right eye to create the effect. This direct viewing requirement -- the HD webcam tracks your eye movements -- means you won't be able to view 3D movies on the laptop with friends, but at least you can ditch the awkward glasses. Zdnet writes that the tracking is surprisingly accurate and quick to respond, and Engadget bloggers said videos they saw on the F750 "were pretty mouthwatering" once their eyes adjusted to the effects. 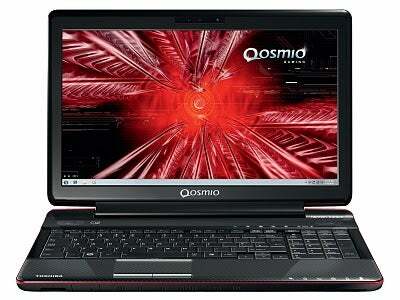 The Qosmio F750 is, as you would expect, designed for multimedia. It features a full HD (1920 pixels x 1080 pixels) display, Nvidia GeForce GT 540M graphics card (up to 2GB), Blu-ray rewritable drive, and Harman Kardon speakers. The laptop comes with 6GB of RAM and uses a second-generation Intel Core i7 processor as well. Toshiba's press release suggests the Qosmio F750 is targeted for enterprise: "a unique way for businesses, professionals and designers to present 3D content...with unparalleled realism and greater depth," but with the sporty shiny red finish and the glasses-free entertainment possibilities, the laptop should turn some heads for consumers as well. Look out for it in August 2011.